Durham, who have completed their programme, are relying on Yorkshire to beat Northamptonshire at Headingley in the final group games. Derbyshire went into yesterday’s game one point behind Durham but lost their way after reducing their hosts to 182-8. Their razor sharp fielding had brought three run-outs but it fell apart as Chris Rushworth was dropped three times in making his one-day best of 38 not out off 32 balls. His unbroken stand of 65 with Gordon Muchall took Durham to 247-8 with the last five overs bringing a very damaging 49 runs. Only a fine innings of 77 by Wayne Madsen kept the game alive, but the lack of support meant the required rate was always rising and others surrendered as Derbyshire were all out for 192. 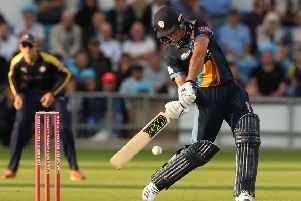 Madsen reached 50 off 62 balls, but with 85 needed off the last ten overs they had only four wickets standing and the pressure told with Tom Poynton’s run out. Madsen then edged a cut to be caught behind off John Hastings, who also clean bowled Tillakaratne Dilshan for 12 on the way to figures off four for 24. After being put in on a sunny morning, Durham’s openers hit six fours in reaching 44 in the eighth over before Mark Stoneman pulled Shiv Thakor to mid-wicket. There were only seven more fours in the innings, two of them by Rushworth, who also hit two sixes off the unfortunate Matt Critchley. The 19-year-old leg-spinner had Paul Collingwood stumped off one which turned sharply and deserved better than one for 57. He should have had Rushworth caught at deep mid-wicket on nine, but Billy Godleman misjudged it, and Scott Elstone later palmed one over the rope at mid-wicket. Inbetween the No 10 batsman survived a steepling return catch to Mark Footitt. Footitt earlier pulled off a brilliant stop and direct hit from backward square leg to run out Scott Borthwick, while Madsen’s hit from mid-on saw off Calum MacLeod. Michael Richardson was involved in two of the run-outs but achieved the rare feat of reaching 50 without hitting a boundary. He then launched one to long-on, but played on against Ben Cotton for 56 off 77 balls. Muchall batted in similar vein to reach 43 off 54 without finding the boundary. Derbyshire’s reply began steadily but with the score on 33 in the ninth over Godleman was bowled through the gate trying to drive Graham Onions. Hastings nipped one through Dilshan’s forward push to take out off and middle then persuaded Thakor to glove a hook to wicket-keeper Richardson. Three wickets had gone down for three runs when Durston fell for 38, edging Borthwick to Collingwood at slip. Elstone and Hughes helped Madsen for a while, but the required rate kept rising and it was as good as over once both surrendered to Collingwood.